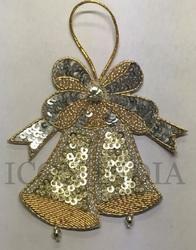 Size: 4 " x 4"
We are leading manufacturer and supplier of Christmas hanging and other Christmas decorative items in metal like aluminum, iron, steel etc. The same design of hanging Christmas bell is of iron metal with silver plating finish. 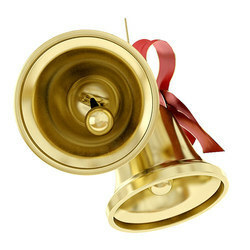 We offer a wide range of Christmas Bells broadly used for decorations and for gifting purposes. These bells are available in various sizes, designs, and shapes as per the requirements and specifications. We manufacture these bells using supreme quality raw material based on latest technology in accordance with the quality standards. These products clients can avail from us at reasonable price. With vivacious definition of colors and an artistic touch, these Papier Mache Christmas ornaments are perfectly alluring. Christmas Decorative Cow Bells are made of iron sheet. Iron Acid Cutting Bell 16x6x18 Cms. Nickel Finish , Jute String Hanging. Create a magical as well as gracious atmosphere with Decorative Tassel. Accentuated with interesting and unique embellishments, the tassels are perfect make any decor more attractive. The sound of the silver Christmas bells can be availed at cherished prices, as we are into the business of sourcing and sourced a numerous manufacturers and suppliers of silver Christmas bells for you.